Details of 2014 co-operations in China, South Korea and Taiwan begin to emerge. Spark Awards will promote and take part in the next CIDF in Shenzhen; the International Co-Creative Design Competition in South Korea and the Taiwan Designer's Week in Taipei. The producers of the eighth annual Spark Design Awards are big believers in co-creation, according to Spark Founder Peter Kuchnicki. "We are about to start work on three events that will utilize cooperative efforts to promote design for betterment. Since this relates directly to Spark's mission, we are excited to have great partners to help propel these efforts." Each project will reach their mutual goals by different means. The China International Design Fair is mounting an extensive effort to gather a generation of great designers and services. The goal is to aggregate, prioritize and share knowledge and best practices about advanced design technologies. The CIDF and Spark teams will work together to promote and produce aspects of both the Fair and the Awards this year. 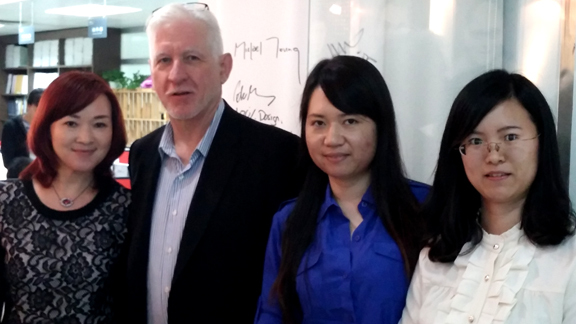 Shirley Feng, Executive Director of the SIDA, is leading efforts in China on behalf of the CIDF and Spark. The CIDF will be held in Shenzhen, beginning November 29. The Taiwan Designer's Week is scheduled for the week of October 3-12, in Taipei. In the months preceding this event, the TDW will be promoting Spark entry opportunities and hosting Spark activities at the TDW. Spark in turn, is seeking sponsorships for the event. "This is probably the most important and vibrant event in Asia for designers," according to Spark Founder Kuchnicki. "Unlike most design weeks, the TDW concerns itself with young designers and firms. This is not about economic development on a macro-level. This is about getting good designers the exposure they deserve and the clients they need. It is the perfect atmosphere for a savvy sponsor interested in supporting cutting-edge and very social design." "We want you!" said Spark Education Director, Clark Kellogg. "Creating relationships with kindred spirits in the design world helps all of us to achieve our goals and support our missions. Design has a responsibility to help rebuild our battered planet. It is a vast task, but we believe that together, it can and must be done." 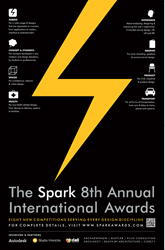 "This is the 8th year of Spark, so Spark is excited to announce the Call For Entries for 8 competitions and 8 all new juries. These include Spark Experience, Spark Product, Spark Transport, Spark Graphic, Spark Spaces, Spark Health, Spark Screen and Spark Concept & Student Design. To find out more, please visit the http://www.Sparkawards.com website."